Tag line: "There's nothing more frightening than a mother's love for a child"
Though it's been almost 20 years, I still remember how frightened I was when we brought our oldest son home from the hospital for the first time. Unlike many of life’s new additions, babies don’t have their own instruction manual. Will he sleep through the night? How often should we feed him? What do we do if he doesn’t stop crying? Eventually, you figure it out, but that initial uncertainty can leave you feeling a bit helpless those first few days. Watching 2009’s Grace reminded me of some of those doubts and frustrations, while at the same time making me thankful that I wasn’t a character in this movie. Being a new parent is scary enough, but dealing with a baby like Grace takes “scary” to a whole other level. After two miscarriages, Madeline (Jordan Ladd) and Michael Matheson (Stephen Park) are hoping this newest pregnancy will go off without a hitch. Despite the protests of Michael’s domineering mother, Vivian (Gabrielle Rose), the couple has decided to seek the services of a midwife, settling on Patricia Lang (Samantha Ferris), who, aside from her vast experience, is also a former acquaintance of Madeline’s (actually, the two women were once lovers, a fact that Michael is unaware of). Then, tragedy strikes: while driving home from the hospital one night, Michael’s airbag malfunctions, causing a fatal accident that claims both his life and that of their unborn child. Though devastated by this terrible turn of events, Madeline decides to carry the baby full-term, and three weeks later delivers what appears to be a stillborn daughter. But to everyone’s surprise, the child begins to move! Believing she’s a little miracle, Madeline names her new daughter “Grace”. Yet what at first seems like a blessing soon turns into a nightmare when Madeline realizes just how “special” Grace is. Though the movie does have its moments of gore, the horror in Grace is (for the most part) more psychological than visceral. And yet this film made me cringe more often than I ever did watching a blood-soaked slasher flick (the breastfeeding scenes alone are traumatic as hell). In addition, Grace gives us not one, but three characters dealing with some sort of trauma, including the loss of a child (Madeline’s mother in law, so wonderfully portrayed by Gabrielle Rose, is nearly destroyed when Michael is killed); a failed romance (Patricia still has feelings for Madeline); or the rigors of handling a newborn on your own (made doubly difficult by the fact the baby in question has “special” needs). Director Paul Solet employs a very deliberate pace when presenting each woman’s story, a pace that, more often than not, increases the tension as opposed to undermining it (the scene where Vivian pulls out an old machine and tries to pump milk from her breast may be subtle, but that doesn’t make it any easier to sit through). As expected, much of Grace is dedicated to Madeline, and how she goes about trying to satisfy her new daughter’s unusual appetites. Yet because of their strength, I was fascinated by each woman’s story, all of which will intersect before the movie is over. 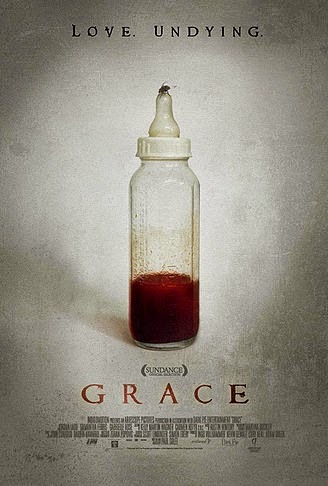 Grace is, in every way, a female-centric horror film, both in its subject matter (childbirth) and the fact that its primary male characters are either absent or weak (Michael is killed early on, while Vivian’s husband, played by Serge Houde, submits to her every whim). But thanks to the fine work of everyone involved, Grace overcomes the boundaries of gender, making it a disturbing, yet wholly satisfying experience for viewers of both sexes. Holy moley! I just watched the trailer and read your review, and this one looks like it might even be too disturbing for me. And I'm an old-school horror fan from way back. Thanks for this review--I've added this to my watchlist.